A mixture of arts and advocacy that will evolve over time, Play the LA River could become a template for urban engagement and exploration. “The question now is, ‘Where is the Los Angeles River?,” says Allison Carruth, one of six Project 51 co-founders and a UCLA professor. “In a decade, we want no Angeleno to ask that question." 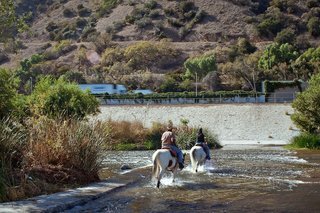 The future of the Los Angeles River has much to do with restoring the natural lifeline of Dwell on Design's host city. 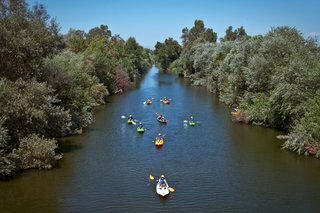 Experts such as landscape architect Mia Lehrer (who spearheaded the river's revitalization plan) and Cynthia Hirschhorn, environmental designer and board member of the L.A. River Corp, will provide firsthand insights into how the river will be restored to a more natural state. Play the LA River is a year-long initiative by the Project 51 collective to encourage exploration and engagement that's launching on September 13, 2014. 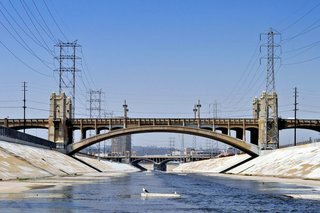 The Army Corp of Engineers recently recommended approval of a $1 billion dollar project to revitalize 11 miles of riverfront property; politicians such as L.A. Mayor Eric Garcetti and President Obama have already pledged support. "The question now is, ‘Where is the Los Angeles River?," says Allison Carruth, one of six Project 51 co-founders and a UCLA professor. "In a decade, we want no Angeleno to ask that question. 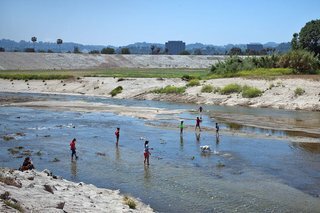 Play the LA River is a practical effort to create a sense of place for the 18 cities along the river, including Los Angeles, and provide orientation and civic engagement." Play the LA River wants to create an invitation for Angelenos to discover the river as it stands now, with art events, games, DIY exploration, and more, all before significant changes are set in motion. Play the River rests on a few different pillars. First, the organization will hand out 5,000 decks of cards to spur play and discovery, with each card showcasing one of 56 sites along the river. Selected after extensive research, the sites showcase the river’s diversity, from gritty underpasses to lush wetlands, covering four geographic suites (Valley, Glendale Narrows, Downtown and South). "We want the project to embrace all these ideas about recreation and fun," says Barron Bixler, a Project 51 member and photographer who designed the website. "Part of it will be popular and fun, and part will be artistic, edgy performances on the river. 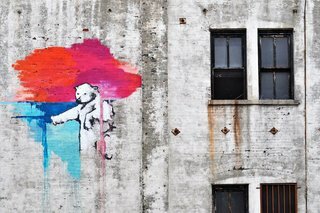 It’s going to be chaotic, but we’re excited to see what people do with this creative canvas in place." Organizations such as Friends of the Los Angeles River have been working on revitalizing the waterfront for decades, reserving years of planning and development that led a once vital source of water for agriculture to become a concrete-covered waterway known known by many as the site of gritty Hollywood chase scenes. Play the LA River wants to add to that conversation around revitalization. As the year goes on, the organization will serve as an umbrella of sorts, throwing their own events while promoting a community calendar from local groups.